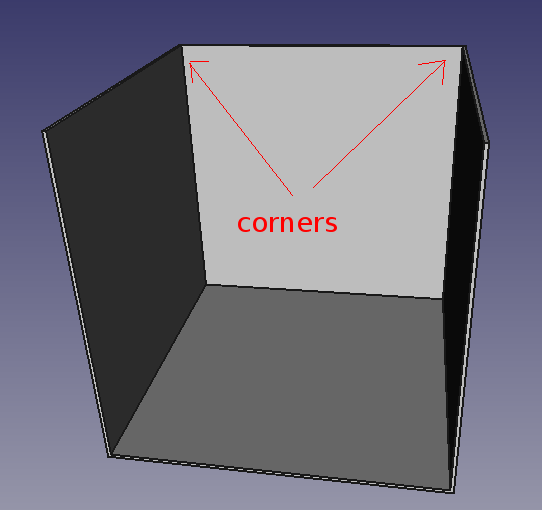 I’ve done the back corners of the printer. Now, I can tackle the front. 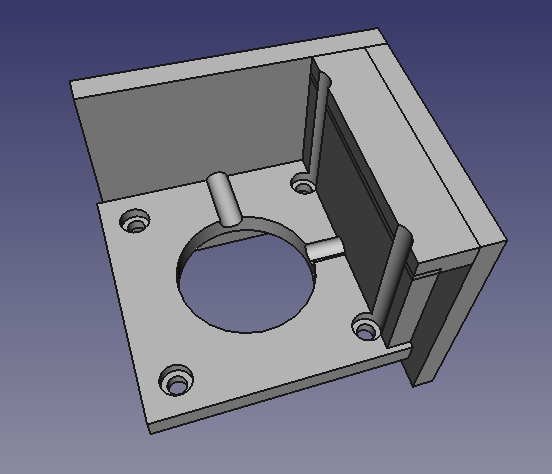 The front corners are where I will put the motors that control the X/Y coordinates of the hot-end. So far, everything I’ve printed is symmetrical, but the two belts are at different heights, so in this case, one motor will be higher than the other. I’ve decided that the right motor (right when facing out from the printer. left when facing the printer) will be the top motor. 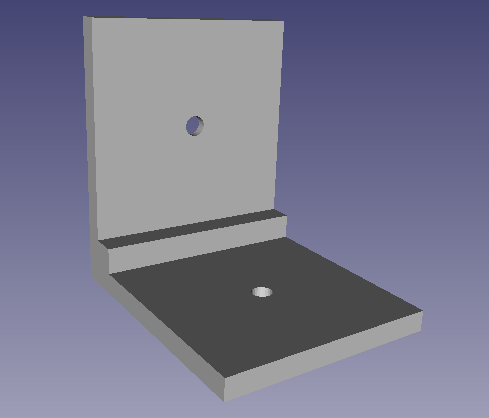 I’ve designed the model for this so that it can wrap over the end of the case edge (and you can screw into it) and bolt the motor into the model. 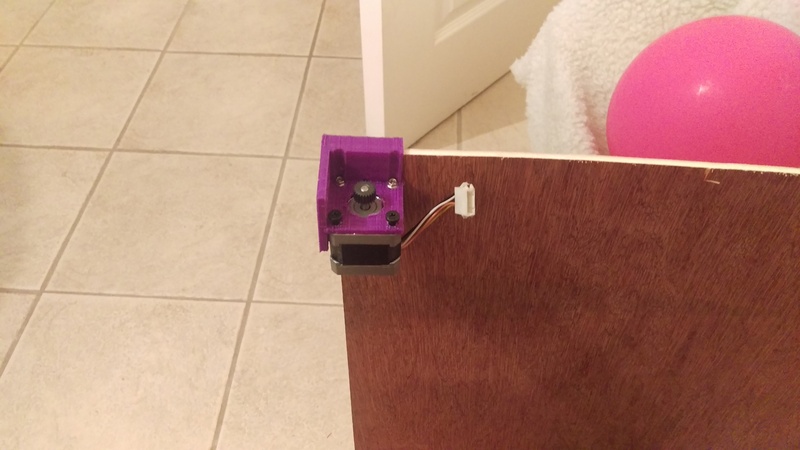 It’s best to print this one on its side, so there is no support needed, and less cleanup in that space between the walls. After printing this out for the first time, I found that the wall space in my print was too tight, so I adjusted the STL file to add 1mm more space. this should not matter much. CoreXY printers have two timing belts overlaid on each other around the box. To allow the belts to move, bearings are placed in various corners. Today, I’ll tackle the back top corners of the printer box. 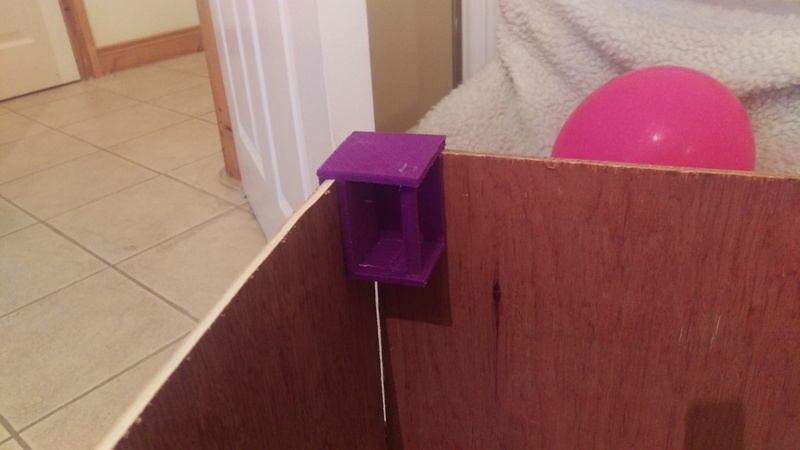 Because I’m trying to avoid using any rods are other forms of complex structure, I decided to come up with a printed solution that I could attach to the wooden corners of the box. This slots neatly over the wood at the back top corners of the box. The design is not yet perfect. 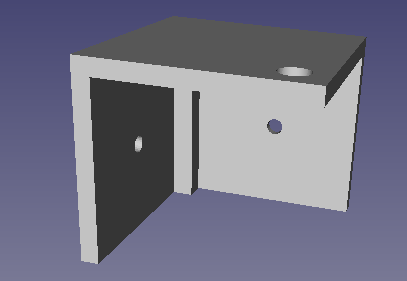 I anticipate there will be pressure towards the center of the box on the bottom bearing, so I should have screw holes at the bottom of those walls as well. But, I think this will do for the “bootstrap” printer. An improvement I will be making as soon as the prototype is complete, is to replace the metal bearings with 3d-printed bearings, like in this video. That will get me closer to having a purely 3d-printed 3d printer. Also, 3d-printed bearings will be cheaper than metal bearings, reducing the cost for future printers. 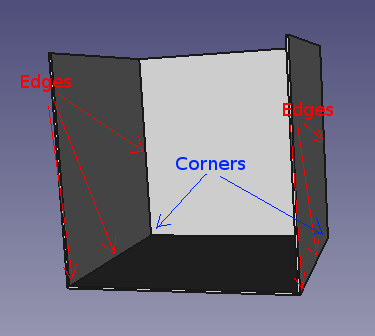 So to create the corners, we will need to print out two each of the outer back top corners, and the inner back top corners. Don’t slot them together until you have your bearings. Otherwise you will find it difficult (or impossible) to separate them without breaking them. 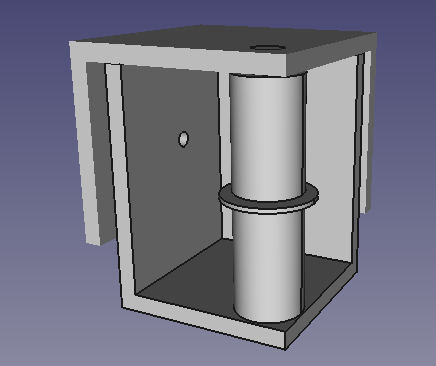 Once your pieces are printed, place an LM8UU bearing on each pole, then a washer, and then another LM8UU bearing. Slot the bottom piece with the pole into the top piece so that the pole goes into its corresponding circular hole in the top piece. You might need to shave the top of the pole slightly to make this fit. Don’t shave too much. 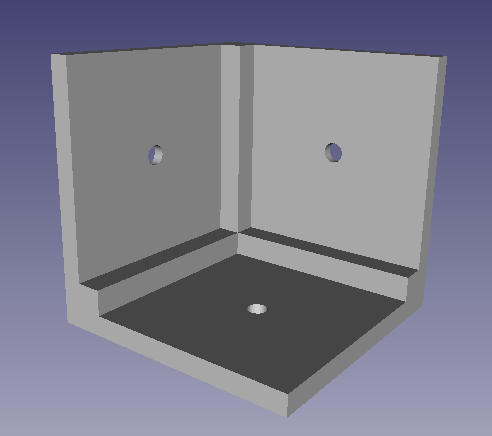 Finally, place the corner pieces over the back top corners of the box and bolt them in place. For the other edge and corner pieces so far, you could use screws, but this one will need bolts because there will be inward pulling force on the pieces from the belts going through them. I don’t yet have the bearings for the corners, so the photo below is of installation on one side without the bearings. When the bearings arrive, I’ll update this post. 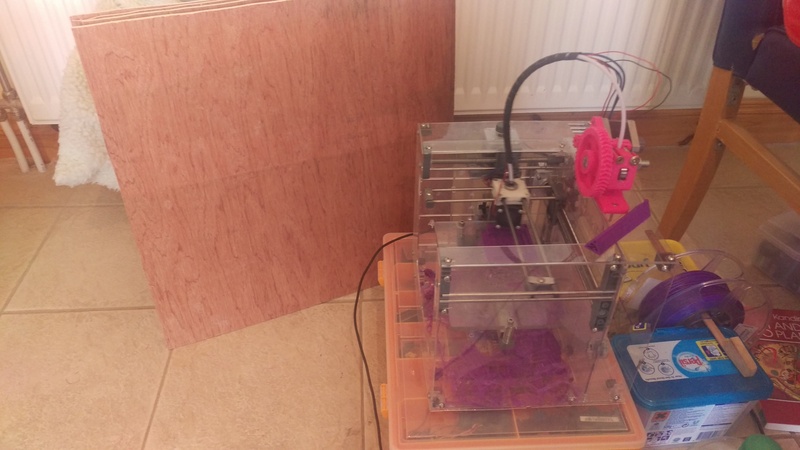 KV Printer 1 will be basically a 50cm^3 cube, giving quite a large printable area. 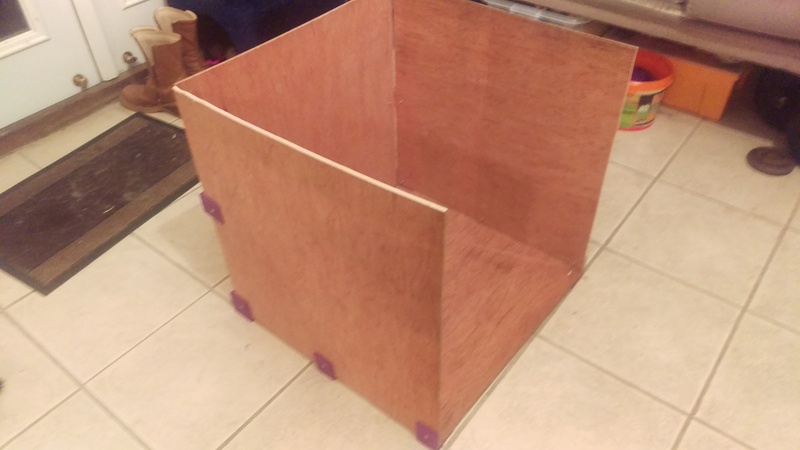 Obtain a 5mm plywood sheet and cut 4 50cm^2 squares in it. These form the base and walls. Next, we need to stick this together at the corners. To do that, print out 2 corner pieces and 6 edge pieces. Using these as templates, drill 2mm diameter holes in all corners of the wooden squares (they’ll be 20.5mm in from X and Y), then screw the squares together like in the third image below. Notice that we have not yet fastened the back top edges together. That will be done in the next post. after working with the MakiBox 3D printer for 8 months, I think I’ve learned enough about its failings to start building my own. I’ve started building a 3D printer of my own, based on the SmartCore idea, but with enough changes that this will be my own design. The MakiBox printer’s major failing (as far as I’m concerned) is in how it controls the X/Y position of the hot-end. To do this, it has two long horizontal threaded rods, against the back wall and the left wall. These rods have long arms positioned on the threads, extending out above the print bed. Where the arms cross each other, the hot-end hangs down. 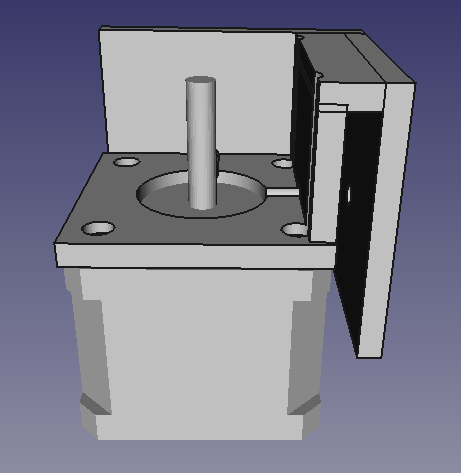 Thus, the position of the hot-end can be adjusted by turning the rods. The problem with this method is easy to see when you consider an analogy. Hold a pencil normally, and draw a 1mm line. Now, hold the pencil by the eraser end and try draw a 1mm line. The precision is just not there. The further away from the fingers the pencil lead gets, the harder it is to control it precisely. One solution to this which I thought of, is to use a Bowden cable (bicycle brake cables, for example) to fix the position of the arms at the screw side to the position of the arms at their opposite sides. This would work, and would increase the precision of prints drastically, but it’s a lot of work and would look ugly. After seeing the SmartCore printer, I decided that instead of fixing what I have, I would use what I have to make a new printer. In a way, I am printing a new printer. At least, parts of one. In CoreXY, the hot-end (or drawing thing in the video) is positioned on a moving platform. It can move in X along the platform, and the platform itself moves in Y along rods in the sides of the frame. 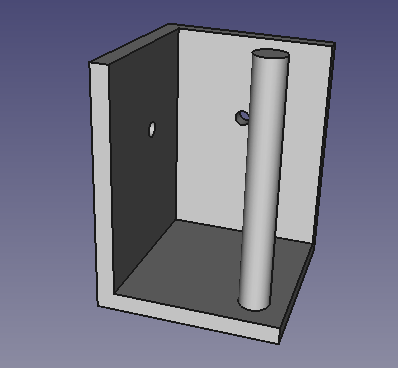 To reduce cost in my own printer, I will replace the Y and Z rods with ledges that the platform will slide along. My calculations suggest that the material cost of my printer will end up being below €150. If this ends up being correct, and the printer is as good as I hope it to be, then I will sell kit packages of the printer for €200. I’m working on construction at the moment. I’ll write more articles as I go.